She did return years later, but wearing a visitor’s pass. By then a community college graduate with a human services degree and a clean record and wisdom surpassing her years, she visited the prison as a role model and to help others get straight. Holmes, a North Minneapolis woman who overcame drugs for a better life, is being honored today by the League of Catholic Women, a group with a name born in a different era and a deep-rooted history of service to women and children. This is the centennial year of the group housed in that little building with the big green door at 207 S. Ninth St. in Minneapolis. Shantae (pronounced shawn-tay) Holmes and two other mothers will receive a $500 check and a Women Becoming award for beating the odds and achieving success. Working for a social service agency, she once led support groups and shepherded women through court appearances, but her real dream was to open a business that would make her some money and help others as well. Today she’s a businesswoman, and that brings new challenges. Holmes has indeed beaten the odds, and her story has been told in the local media. But when you talk with her, beneath the upbeat tone and behind the pride of accomplishment you hear a hint of uncertainty brought on by a poor economy and a tornado. 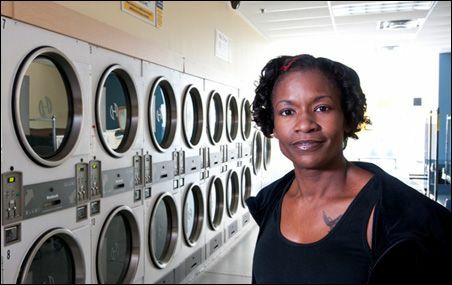 Almost 14 months ago Holmes, 40, realized that goal, opening All Washed Up, a laundry service in a redeveloped commercial area on the North Side near Penn and Lowry Avenues N. Neighbors and the business community applauded. Sen. Al Franken even came by to shake her hand. Her business is 3,128 square feet of family-friendly sunny space with 22 washers and 22 dryers, a couple of flat-screen TVs, a kids’ play area and snack-food vending machines, as well as laundry pick up and delivery service. What makes it a stand-out is Holmes upfront, greeting customers with smiles and offers to help. Getting the business up and running was a major communal effort, involving profits and non-profits, including St. Paul-based Wellington Management, the Metropolitan Consortium of Community Developers and the Northside Economic Opportunity Network (NEON). “Shantae is a very, very unique individual,” says Grover Jones, executive director of NEON, an organization that works with minorities who want to start businesses, particularly in North Minneapolis. Holmes, he says, came from a religious upbringing and a good family, but she’d fallen off the rails for a while. She came to NEON for business-start-up help. “It was not an easy project to pull together,” Jones says, but she persevered. Start-up costs ran about $375,000 for outfitting her building, purchasing equipment, including about $40,000 from her own pocket, she says, and not counting the expense of all those costly extras like plastic slipcovers for clothes, business cards, hangers, a wet vacuum, an industrial fan. “It left me $14 of working capital pretty much,” she tells me, admitting she’s still not paying herself a salary, though she pays three other employees. Getting the business up and running was a major communal effort, involving profits and non-profits. Their wedding is in the distant future. “Right now we can’t even afford to buy a broom to jump over. We maybe could afford the rice,” she laughs. Factor in a major economic recession and a tornado sweeping past her door in May, and see her challenges. Her building wasn’t damaged but power outages cost her. No electricity, no business. Still, when the lights came on she passed out free laundry coupons to tornado victims, a generous gesture to the neighborhood she grew up in and a good marketing move paid for in part by a consortium of area churches. Customers trickled in one mid-morning Monday to the self-serve laundry on a street corner that used to attract the prostitution trade. The door opens and Holmes turns on her smile. “Welcome to All Washed Up. Can I help?” Holmes asks patron Cari Acker. No, she’s fine, Acker says, acknowledging it’s her first time there, that she’s pushing a pile of white plastic bags with dirty laundry in a running stroller because the tornado that ripped through town last May destroyed her car and damaged her house, including her washer and dryer. Do you need help? Holmes asks, because there are resources out there and she could steer her in the right direction. No, she had insurance, Acker says, smiling. As for her business future? The next six months will tell, Holmes says. Now it’s up to the community to show support, even though customers wait a little longer before making that trip to the laundry and try to fill the wash tubs a little too full. It’s the economy, she says. The League of Catholic Women’s awards, says President Rita Fox, both recognize the heroic strides of remarkable young women as well as highlight the League’s 100 years of service. Fox says the awards are a “recruitment and publicity effort” to bolster membership and keep valuable programs going. League members are first responders of a sort, recognizing the unmet needs of women like Holmes, as well as children and immigrants, and then stepping in to help. A century ago they operated residences for single working women, later sheltering fatherless children and their mothers, and operating group homes for girls and boys. More recently through their First Impression program they supply job-interview coaching and professional clothing to those in need, stock cloth gift bags with toiletries and more for women leaving incarceration. Their Read to Me program matches members and kids from the Northside Achievement Zone. At luncheon today at Midland Hills Country Club in Roseville, Holmes and two other women will receive awards. Natasha Holt, also of North Minneapolis, and mother of two, including a child with cerebral palsy, who graduated from Minneapolis Community and Technical College in June and is working toward a four-year degree to become a hospital child-life specialist. Helping the women reach their goals were different groups, including the League with such efforts as its By Your Side mentoring program, as well as Northside Child Development Center, St. Catherine University’s Access and Success program, and the Jeremiah Program, Fox says.